For more than 45 years Ventil Test Equipment is dedicated to the design and manufacturing of high quality valve test units for pressure and leakage testing. An unrivalled commitment to quality and performance, continuous development and innovating in close cooperation with our clients, have brought us where we are today; World’s leading manufacturer of high pressure test equipment for industrial safety control and shut off valves. Ventil is one of the leading manufacturers of high pressure testing equipment for industrial control, safety and shut-off valves. Ventil has been in operation for more than 60 years now. They are the key supplier for custom built solutions and are designing and manufacturing high quality solutions for testing of industrial and safety valves. 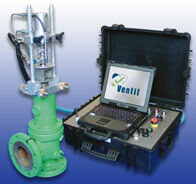 Ventil test units are used by valve manufacture & repair companies in more than 85 countries worldwide. 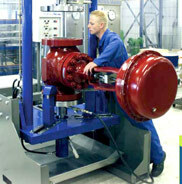 The dedication to quality and innovation has lead to Ventil's current reputation as the world's leading manufacturer of valve testing gear. The ORBIT is a robust, lightweight Grinding & Lapping machine for in-shop or in-situ reparing of damaged valve seats. The setting up and construction of the ORBIT is unique, and makes it suitable for all types of vertical seats (Check valves, Parallel slide and Gate) and horizontally mounted seats (Safety and Globe valves). The Focus hand lapping system will enable you to achieve a high quality mirror finish with the lowest cost. The composite blocks can be used for components up to a diameter of 2.5 to 65mm.